Euphorbia ingens growing succulent of the genus Euphorbia also known as Candelabra tree, Euphorbia ingens perennial evergreen used as ornamental drought tolerant plant, can grow in desert, mediterranean or subtropics climate and growing in hardiness zone 9b-12. Stem erect in color green the edge of the stem with spines, the stem looks like assembled lobes. 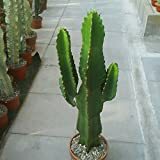 EUPHORBIA LACTEA Dragon bone cactus Elkhorn plant succulent cacti candelabra 4"